A handy set of 3 brightly coloured Inflatable Toy Tools. 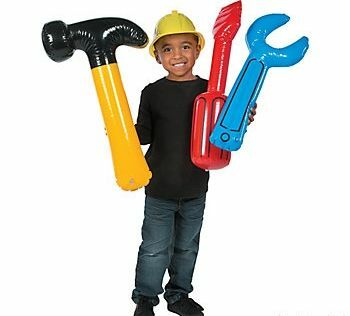 A fun inflatable set fit for any little aspiring worker that includes a big inflatable hammer, a bright red oversized inflatable screwdriver, and a blue spanner wrench inflatable toy. A fun toy set all year round and a great addition for kid's parties or any themed events. This inflatble tool set also makes a perfect prop for fancy dress outfits. A fun inflatable set from our Novelty Inflatables, and Fancy Dress Inflatables sections.